City: 16 – Hwy: 22	Actual rating will vary with options, driving conditions, habits and vehicle condition. The 2014 Ford Explorer is a far cry from the original, rough-and-ready Explorer SUV. Whereas the old Explorer rode atop a truck-based body-on-frame platform, the new model uses unit-body construction that’s lighter and more carlike. The old-school engines are also long gone, replaced by state-of-the-art powerplants with such features as gasoline direct injection and turbocharging. About the only thing the new Explorer concedes to the previous truck-based design is towing ability, which drops from 7,000 to 5,000 pounds. Relative to current rivals, the Explorer stands apart with its smooth ride, sleek design and high-quality interior with cutting-edge technology. The 7-passenger SUV might not be as roomy as a minivan or even some slightly larger competitors from GM. But there’s no doubt the reinvented Explorer is one of the best of its breed. The Explorer receives only minor equipment updates for 2014, including standard automatic headlights and trailer sway control across the lineup. The standard Explorer engine is a 3.5-liter V6 rated at 290 horsepower and 255 lb-ft of torque. Environmental Protection Agency fuel economy estimates stand at 17 miles per gallon city/24 mpg hwy (front-wheel drive) and 17 mpg city/23 mpg hwy (all-wheel drive). There are also two EcoBoost turbocharged engines available. The 2.0-liter 4-cylinder EcoBoost is rated at 240 hp and 270 lb-ft, and it’s offered only with front-wheel drive. Fuel economy is an impressive 20 mpg city/28 mpg hwy. The 3.5-liter EcoBoost twin-turbo V6, offered only with all-wheel drive, is rated at 365 hp and 350 lb-ft, but fuel economy drops to 16 mpg city/22 mpg hwy. All three engines are paired with a 6-speed automatic transmission, though the EcoBoost V6 gets shift paddles on the steering wheel for manual control. The all-wheel-drive-only Sport ($41,675) comes standard with all-wheel drive and the exclusive twin-turbocharged EcoBoost V6, and it also features unique 20-in wheels, a blacked-out exterior styling treatment, a sport-tuned suspension and sport front seats. 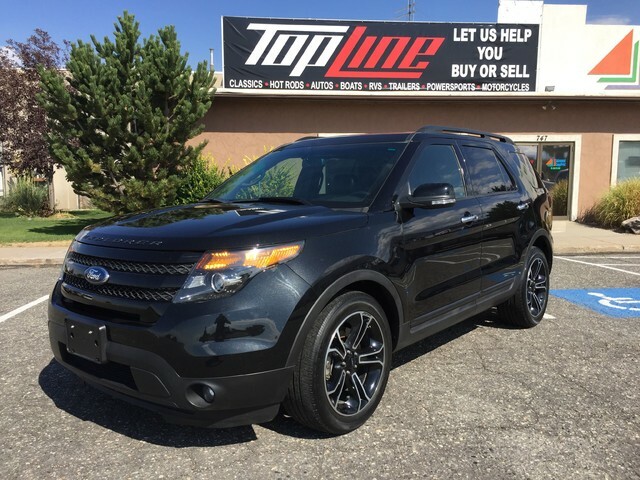 The 2014 Ford Explorer is equipped with airbags all around, including front, front side impact, front knee and side curtains covering all three rows. Optional starting with the XLT trim are inflatable rear-seat outboard seat belts to cushion occupants from injury in an accident; they’re compatible with child safety seats. Standard safety equipment includes anti-lock disc brakes, stability control, trailer sway control and Hill Start Assist, which keeps the vehicle from rolling backward when stopped on a steep incline. The 2014 Explorer received a perfect 5-star rating in government crash tests, including five stars for both front and side impacts. By 3-row crossover standards, the Explorer feels solid and connected to the road. Steering is firm and accurate, and the vehicle handles curves reasonably well. From the driver’s seat, however, the Explorer feels even larger than it is; that’s due in part to the narrow side glass and the thick front and rear pillars, which impede visibility. You’ll love the smooth, quiet ride, though. The standard V6 engine has no problem moving the Explorer, with good low-end power and a transmission that responds quickly when more power is demanded. Fuel economy can be disappointing, however. The 2.0-liter EcoBoost rectifies the fuel-economy problem, but it’s a bit slow for this class, even though its healthy torque output masks this in normal driving. Naturally, our favorite is the Sport’s 365-hp twin-turbo V6.